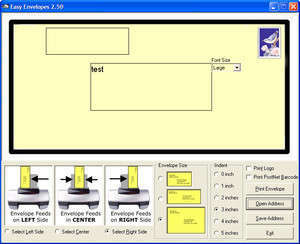 Easy Envelopes is designed to print single envelopes effortlessly. It does not have all of the complicated things like batch processing, mail merge, and databases that you don't need and don't have to pay for. Most standard envelope sizes are supported. Try Easy Envelopes for yourself and you will discover that it's the best program for printing envelopes. Easy Envelopes 2.50 is a shareware program and can be used as a demo to try the software until the free trial period has ended. A full version of the program is available after the trial period ends. For security reasons, you should also check out the Easy Envelopes download at LO4D.com which includes virus and malware tests. Additional screenshots of this application download may be available, too.